Sorry for not posting these past 5 days. Im not exactly sure what happened there... I think I wanted to play Dappervolk, which is a new game I found and a few other bloggers have been playing. Ive also been working on plushies that I got a kit for my birthday and have been doing other things so yeah:) But I am here to post, which I have been meaning to do. So let's get into the post shall we? Today we have the abstract chair sold in jam mart furniture for 450 gems! This item actually is a nice price costing only 450 gems! PAINTINGYOURTRAUMA, aka Cookies are mine! I hope the account, animals, and pet I chose was okay! 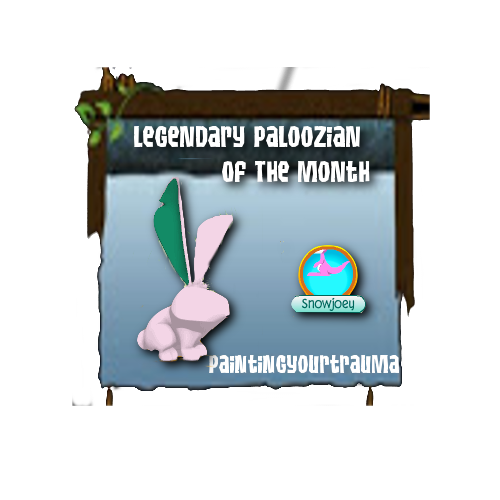 Sorry for having the LPOTM so late, it would have came sooner if I posted earlier than 5 days ago... Whoops! As I said, before I would be having a what I would hope to be, a small contest for my birthday, since we recently had contests finish last month. As well as party for my birthday last week. So I do have a contest idea/activity in mind that I do think will actually be quite fun:) But, because that would take a lot of planning and I would like to chill as much as I can these last two weeks of summer, I decided I would do a Q&A instead, of the contest. Don't worry I will still do the contest sometime when I get a chance, hopefully this fall or before the New Year, yeah I get it, that seems far away, but with school I won't be able to post as much as I thought I would be able to so you'll just have to wait for that!! But I mean as the old saying goes, "Time flies by fast when your having fun!" Anyway's more info on the Q&A! I actually haven't done a Q&A before on this blog, at least I don't think so I thought it would be fun! So yeah! Make sure to start commenting those questions ASAP!! Also, don't forget to enter the plushie challenge if you haven't yet! Do you plan on going to college? Or are you in college? What was this blog's layout like when you first started? Anything you want to add in animal jam, if so what? I didn't know that other Jammers played DV either, I thought I was the only one ahah, since I'm into a LOT of avatar sites. Another window to sign up is open tomorrow for DV, just note that it's currently in beta stage, so all your progress, when it actually launches, goes back to zero. -If you could have a superpower, what would it be? -What's your favorite subject in school? -Do you have any hidden talents? -What was the best gift you've ever gotten? -If you had to draw in one certain art style, (e.g. realistic, manga, chibi, cartoon or the like) which one would it be? -What's your favorite part about blogging?